Wedding Locations Detroit Welcomes You! It's with pleasure that we welcome you to the pages of Wedding Locations Detroit! This website was inspired by our many invitations to weddings in the past several years. We have visited so many gorgeous wedding locations in Detroit, and decided that we would share those locations with those who are perhaps trying to decide where to hold their own wedding! It's our hope that you'll find exactly what you're looking for here. The beauty of our city, and of all of Metro Detroit, is that it is on that upward path to being the city of glory that it once was. Once upon a time, we were Motown. We were the Motor City. And as we now welcome movie studios into the mix of our area's economy, we find ourselves once again in the national spotlight. 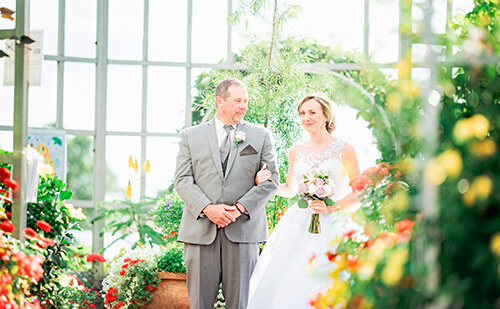 That story of triumph may remind you of your own relationship, and that's just one of many great reasons to hold your nuptial ceremonies here in Detroit. Whether you're the type of couple who dreams of getting married at an elegant cathedral, or the type who dreams of standing barefoot on a beach, you will be able to find the wedding location that is just perfect for you on these pages. The choices are not extensive here -- rather they were carefully selected from the Detroit wedding venues that we have personally attended and enjoyed. We could have compiled an exhaustive list, but so many sites have already done that. Instead we believe it's in your best interest to know the reasons that we loved these venues, and why we recommend them to you. Personal experience is more valuable than a list of names and telephone numbers, especially when it comes to planning the wedding of a lifetime! Please enjoy browsing the pages of this site, and most importantly, remember to enjoy the process of putting your dream wedding together. Keep it simple and elegant, and your big day will be one that you'll remember forever! Thank you for visiting our site. We hope that you enjoy your time here.